In preparation of an article discussing the advantages and disadvantages of various sensor sizes for a given camera performance, I try to set a common ground for such discussions. The short version is this: An image contains no information whatsoever about the size of the sensor within the camera which was used to capture it. None. Nothing. Nada. (except EXIF of course ;) ) The proof is beyond the scope of this blog article and the article only gives some clues. But this is a fact, trust me. Therefore, all cameras which could have captured a given image create a so-called equivalence class: they are all equivalent, producing indistinguishable images. And they have different sized sensors! By camera, I mean a camera with all the parameters defined it used to capture an image, such as the variables shown in the title image. Changing any variable "creates" a different camera. The exposure time used to capture an image is defined implicitely too: the one giving correct exposure (and it is a constant of course for indistinguishable images). 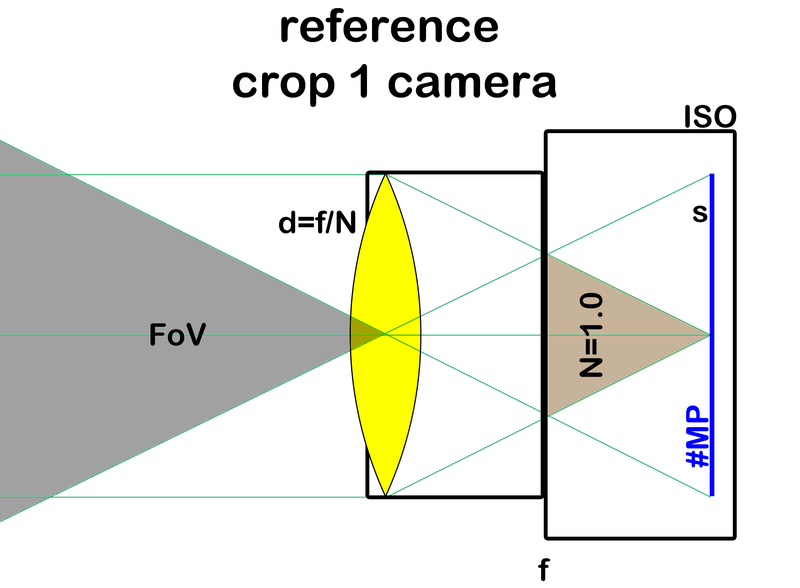 The camera's lens has the same absolute diameter but it's focal length is shorter to maintain a common field of view. The equivalent crop-2 camera has a different F-stop and ISO sensitivity. Any discussion about the impact of varying sensor sizes must be based on cameras made equivalent first. Otherwise, any comparison will just reveal the inequivalence of parameters the respective cameras have been set to and nothing else. And such a result would be trivial, known and not worth a further discussion. Such trivial results are that a larger sensor produces a more shallow depth of field or less image noise. This is not true! Because it just means that the cameras were used with non-equivalent settings, e.g., with lenses of different diameter d which means with lenses of different weight and cost. Another example are ISO comparisons between cameras with different sized sensors but ISO kept the same. Such comparisons are pointless! Instead, compare a FourThirds camera at ISO 100 with a full frame camera at ISO 400 because only then they are equivalent. Not doing so just compares the size of lenses which a ruler can do just as well. Once equivalent cameras are compared, results start to become interesting. Because now any deviation is due to deviations with respect to an ideal camera. Such like a lens with aberrations, production or design tolerances or compromises in a CMOS production process. The white paper explains that such deviations are generally expected to be larger with smaller sized sensors. 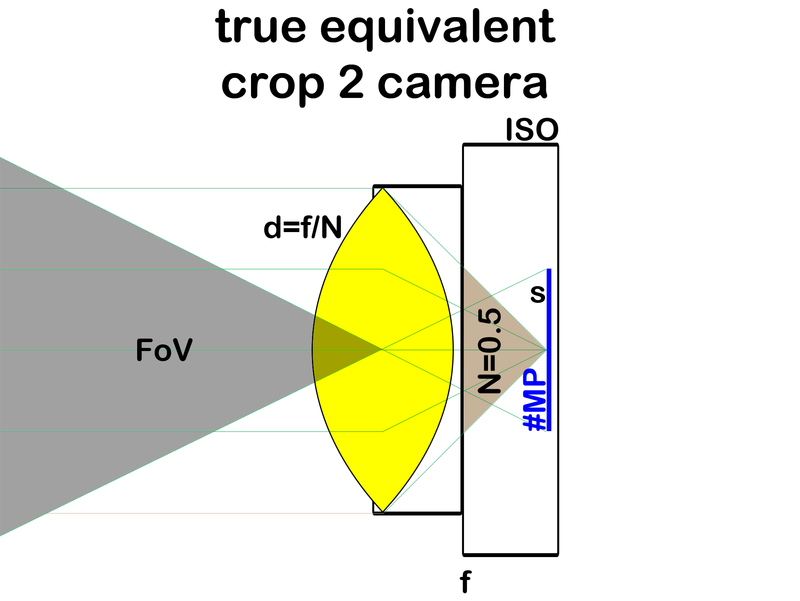 Of course, one such deviation is obvious: when an equivalent camera doesn't exist for a sensor size, e.g., because an f/0.1 aperture is unfeasible. I will follow up this article with a more complete article of the impact of sensor size on image quality.